Around July 2008, the webmaster of the Fire Emblem Universe website, Arch, managed to obtain detailed information about a number of Fire Emblem prototypes (Genealogy of the Holy War, Thracia 776 and Binding Blade) from an online contact, Memento Mori. The information originated from a girl whose father allegedly worked as a programmer for Intelligent Systems (the series’s development team). This girl collected notes about the prototypes over the years, saved as PDFs, albeit written in poor English, with some words left untranslated in Japanese (which is entirely understandable, given that the girl was Japanese). exclusive, however Arch has kindly allowed the information to be hosted on this site as well. Below, you will find my interpretations of the prototype notes and you can also read Arch’s version (for all three games) here. Guinevere was playable and acted as a second Lord. It seems Lilina and Tate were originally cousins (perhaps changed when Tate became one of the Pegasus sisters?). It was mentioned that Lilina used “Storm and Thunder first”, presumably the name of her starting spells. An early version of the game does show her wielding two tomes, one of which is indeed Thunder, but the other is Fire. Gale was recruited by keeping Miredy and Zeis alive and then talking with Miredy. There are signs in the release that Gale may have been a playable character at one stage. Igrene possessed dragon blood, just like Sofiya. Not completely surprising considering the culture of Arcadia. Brunya and Zephiel were lovers. In the release, there are implications that Brunya had feelings for her liege, but there is no tangible relationship. The Binding Blade was obtained from Zephiel, instead of from the Shrine of Seals. In the Hasha no Tsurugi manga, Zephiel carries the Binding Blade with him, which may have been influenced by this. Jahn survived his first battle and appeared again during the Final Chapter to aid Idoun. Many Dark Dragons (not Demon Dragons like Idoun) appeared in the final battle. It seems some Dark Dragonstones could have been obtained, which Fa was able to equip. The Eckesachs had 50 uses instead of infinite. It seems that it could be obtained, presumably along with the Binding Blade after Zephiel’s death. This screenshot is not real. The Dragon Spear was Gale’s personal weapon. Its stats were: 12 Might, 85 Hit, 5 Crit, 12 Weight and it had the effect of doubling attacks like Brave weapons. 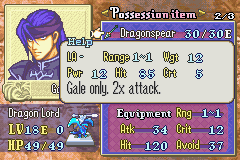 This weapon seems to be similar to Dean’s personal weapon, the Dragon Lance, in Thracia 776. The Sea Sword could only be equipped by Heroes (perhaps to counter-balance Myrmidons with the Wo Dao?). Its stats were: 9 Might, 70 Hit, 10 Crit, 9 Weight and, like the Dragon Spear, it had the Brave weapon effect. The name of the weapon suggests it may have been in Echidna’s possession. Meteor was a long-ranged tome, similar to in earlier games. It had the following stats: 11 Might, 65 Hit, 5 Crit, 12 Weight. Oddly, there is unused data in the game indicating that Blizzard was planned as a long-ranged tome, but nothing about Meteor.